ST. GEORGE — A Utah Highway Patrol Trooper is in extremely critical condition after being struck by a vehicle while trying to alert motorists of a low-hanging power line on state Route 13 in Box Elder County. 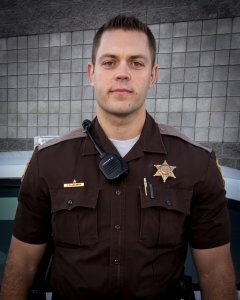 Trooper Eric Ellsworth, a seven year UHP veteran, was dispatched at approximately 9:45 p.m. Friday to a report of low hanging power lines across SR-13 near 13600 North, near Garland City. As the trooper got out of his vehicle he was hit by a 2006 Chevrolet passenger car driven by a 16-year-old girl traveling in the opposite direction, according to a statement released at 12:40 p.m. Saturday by Chief Deputy Dale Ward of the Box Elder County Sheriff’s Office. Ellsworth was critically injured and flown to Intermountain Medical Center in Murray by the hospital’s Life Flight helicopter. Officers at the scene determined that Ellsworth was waiting for Rocky Mountain Power to respond to the area to repair the damaged power line. He had exited his patrol car to slow traffic and to warn a semi truck driver of the low hanging power line as he approached the area. “At this early stage in the investigation there appears to be no evidence of impairment or distraction on the part of the driver,” Ward said in the statement. The Chevrolet was towed to the Elder Box Sheriff’s office immediately after the crash to preserve any evidence to be collected and documented in the ongoing investigation. The Utah Highway Patrol is working with detectives to determine the cause of the crash. Conditions present at the time of the incident were clear and cold while the pavement surface was dry in an open two-lane road with no street lighting, according to the statement. Ellsworth has spent the last five years in the Box Elder region of the state, according to information obtained from the Utah Highway Patrol. Ellsworth is also a second generation Utah State Trooper, as his father retired after serving many years with the UHP. Sounds like she must’ve veered way out of her own lane and over the center line. Distracted driving?